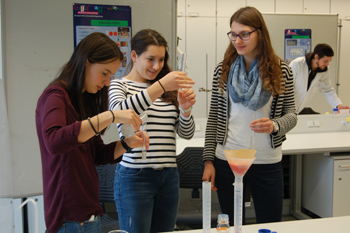 With the Student Lab Project (Schülerlabor), we bring science to schools, motivating young people to start a career in science with simple yet fascinating experiments. Experiments feature, among others, DNA isolation, PCR and gel electrophoresis. Two PhD-students will be in charge of preparing and supervising experiments. 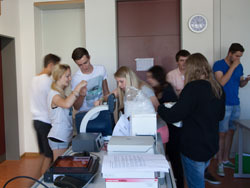 Materials and machines are provided by the university and have to be brought to the school, where experiments should be carried out in a suitable environment. Schools should apply for this day and date. Experiments are then individually planned. Furthermore, one PhD-student, or professor if available, should give a talk (45 min) on a current scientific topic, which can be discussed with the students afterwards. Those PhD students who take part in this project will receive credits points for their RIGeL Leistungsheft. 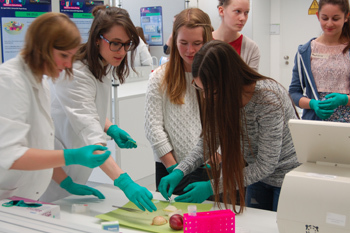 The Student Lab Project brings Life Science to schools and enables them to carry out experiments at their own facilities. We offer experiments that can be executed in schools facilities, providing scientific insight. Potential experiments include isolation of own genomic DNA, amplification of a DNA segment using PCR, visualization of DNA via gel electrophoresis, transformation of E.coli and so on. Furthermore, there is the possibility of a scientific talk (45 min) in which a current topic is discussed with the students. Experiments are supervised by two RIGeL PhD students, who will provide the necessary equipment to carry out the experiments. If you want to take advantage of this unique opportunity, please send an email requesting an appointment. The ensuing personal contact will set the date and content of the event. If interested please contact us!